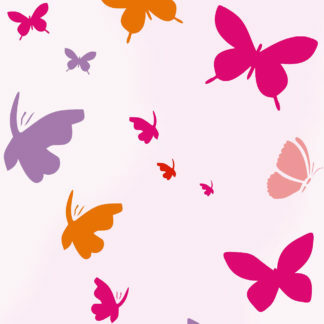 The Large Polka Dot Stencil is a versatile repeat stencil – simplicity itself – giving a host of decorating options. 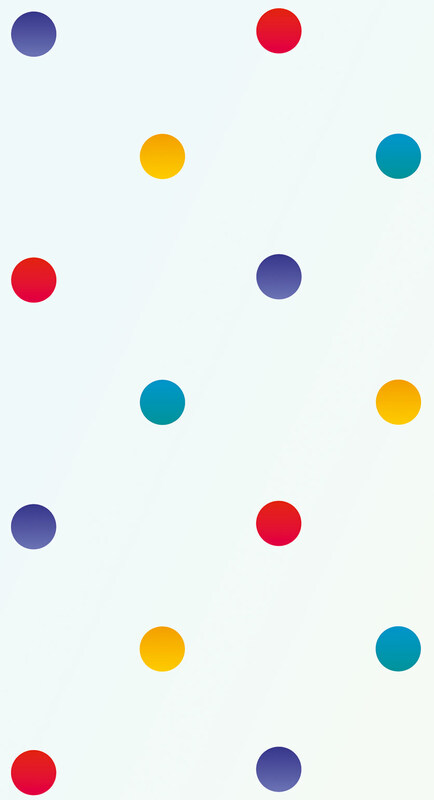 The large 5cm (2″) diameter Polka dots are fun and funky and can be used for bold stylish effects – a modern take on a timeless design that responds well to many different colour treatments. See size and layout specifications below. 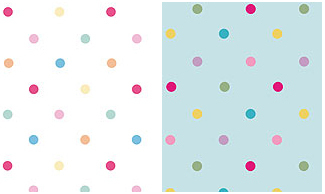 The large polka dots of this repeat stencil are ideal for covering walls and fabrics with either a splash of multi-coloured pizzazz, cute pastel shades or single colours. Choose any combination and it will work! See right for some of the colour possibilities you can choose from and links to our Stencil Paints so you can reproduce these colour sequences should you choose. 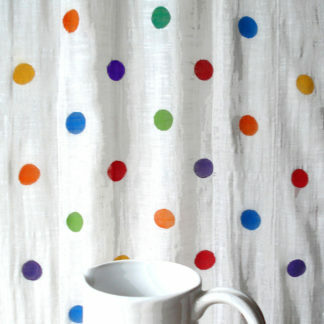 The polka dot circles on this design are large enough to make an impression, but small enough to retain the timeless appeal of the repeated polka dot. 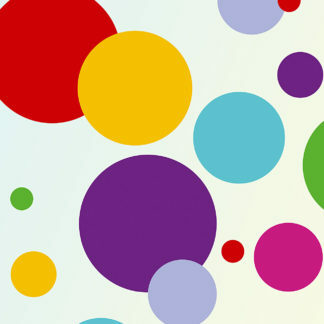 Above top – Large Polka Dots in colour sequence of Very Berry, Damask Rose, Indian Purple, Harvest Gold, Seville Orange and Verbena Stencil Paints. Above – Large Polka Dot Stencil shown in China Blue, Very Berry, Paradise Blue, Harvest Gold Stencil Paints. 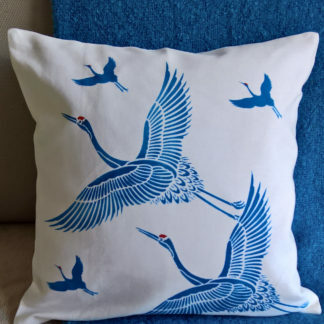 Stencil with a stencil roller or stencil sponges, or try using spray paints! See also our Small Polka Dot Theme Pack stencil – 2 small sized polka dot stencil sheets; or our Circles Theme Pack – six different sized stencils for creating modern random circluar patterns. 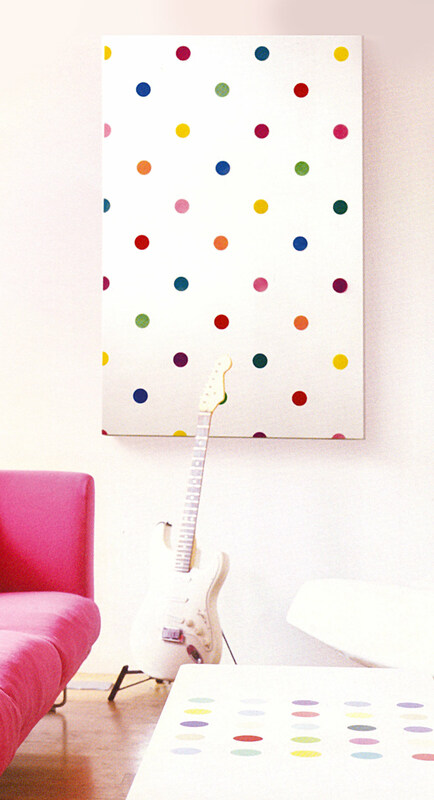 Above – the large Polka Dot Stencil has been used to create a decorative panel, echoing colours and features of the interior room scheme. 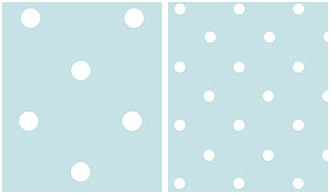 Above – Large Polka Dots in Ice White Stencil Paint on a duck egg background (illustration left – gives an impression of large scale of dots). 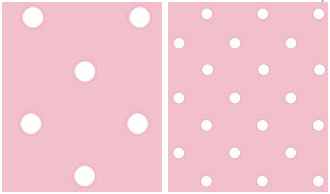 Above – Large Polka Dots in Ice White on a sugar pink background (illustration left – gives an impression of large scale of dots). 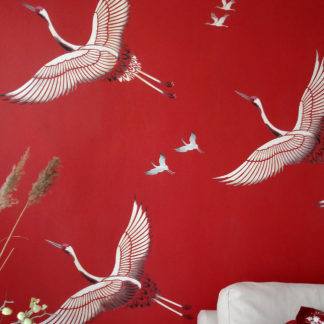 Above – colour sequences of; Left – Very Berry, Nougat, English Rose, Chinoiserie, Paradise Blue and Seville Orange Stencil Paints; Right – Verbena, Very Berry, Harvest Gold, Paradise Blue, Plum Blossom and English Rose Stencil Paints. One sheet stencil. 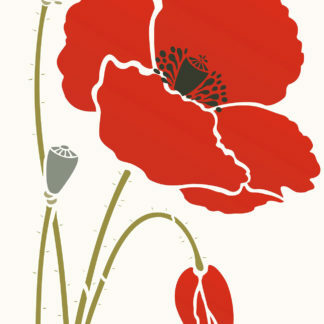 This easy to use repeat stencil is a one layer design and comes on one large sheet. 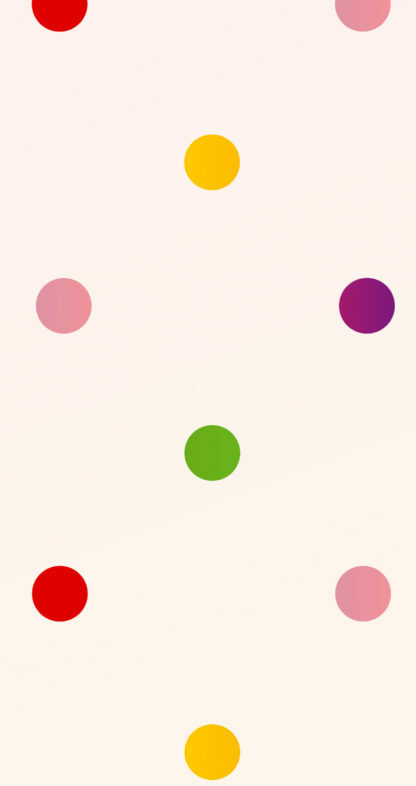 The polka dot circles are 5cm/2″ in diameter and 22cm/8 1/2″ apart. 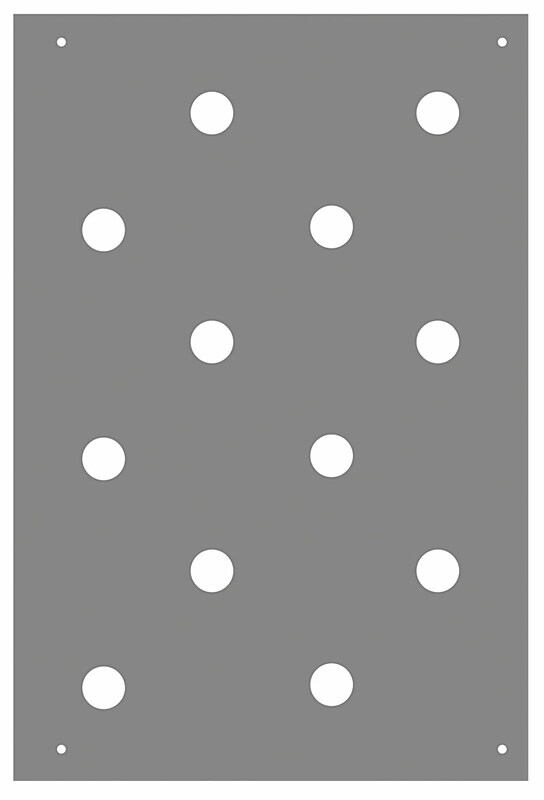 The stencil sheet contains 4 rows of alternating polka dots with three dots per row. The width of each repeat is 74cm/29″. 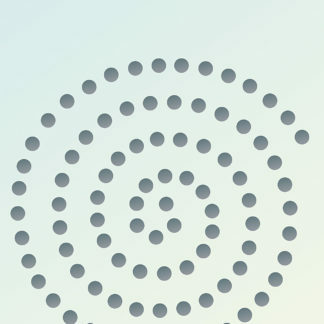 The depth of each repeat is 46cm/18″. 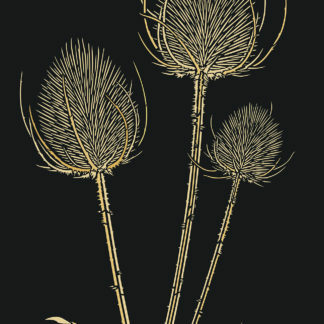 See below right for illustration of actual stencil sheet. Alignment – This repeat stencil is easy to align with four useful registration dots in each corner – and the pack comes with full usage instructions. Colour sequences – For colour sequences choose either 4 colours for a simple effect (alternating colours on two rows), or 6 colours for a multi-coloured effect (alternating colours on three rows). If you would like a polka dot outline planner sheet (an A4 sheet of polka dot outlines) to help plan out your colour sequence – you can ask for this with your order, simply mention it in the Comments Box in the Checkout.